This third installment of a story about vampires versus humans in a fictional future was released in France last year and is available in this good translation very soon after in the USA. I have not read the first two parts of this series, and I found it quite difficult to work out what exactly was going on. It would be helpful to have the plot so far summarized at the start of the story. 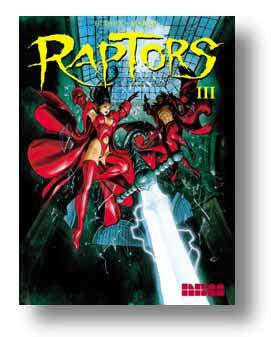 But its really the graphics that is the strength of Raptors III; it is set mostly in New York City and the combination of nighttime gothic scenes with bedroom erotica is effective. The story includes plenty of corny sorcery, and the graphics, while powerful, are very much within a genre rather than pushing the genre to its limits. Theres nothing particularly thoughtful or surprising about the book, but it is done proficiently and with nice use of color.